Iconographic Features: Feline Face consisting of a feline head and one human arm. It holds a bloody club. Snakelike streamer (= extended tongue) emerges from the mouth, terminating in a feline head with “snake eyes”. Snakelike streamer depicted with enclosed pepinos. Feline Face is surrounded by pollywogs indicating water. Interpretation of Feline Face as celestial body. Related Themes: Click link to see related item(s) CL 94, 95, 110, 103, 104, 105, 106, 260, 281, 282, 283, 284, 285, 286, 287, 289. Iconographic Features: Rayed Face with Upturned Mouth Mask consisting of a feline face and two human arms. It wears a large mouth mask with upturned lateral elements. It holds trophy heads. Extended tongue in the shape of a killer whale/main figure devours a killer whale. Pampas Cat and Rayed Face appear between the sleeves. Interpretation of Rayed Face with Upturned Mouth Mask as celestial body. Same painter as in CL 292. Description: double spout bottle, C-09956, M.N.A.A.H.-Lima. Iconographic Features: Rayed Face with Upturned Mouth Mask consisting of a feline face and two human arms. It wears a large mouth mask with upturned lateral elements. It holds trophy heads. Extended tongue in the shape of a killer whale/main figure devours a killer whale. It is surrounded by fishes (?) indicating water. Pampas Cat and Rayed Face appear between the sleeves. Interpretation of Rayed Face with Upturned Mouth Mask as celestial body. Same painter as in CL 291. Iconographic Features: Rayed Face with Trident Crown and Upturned Mouth Mask (Proulx 2007, 111) consisting of a feline face and four paws. 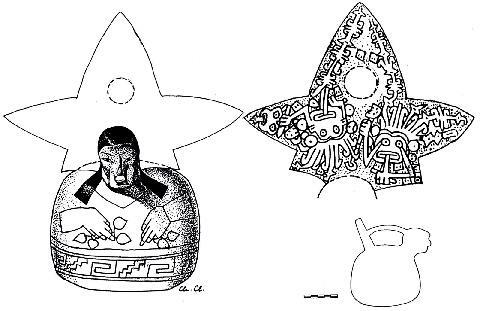 The representation on the right shows the being with feline face, two paws and two human arms. It holds hair hanks. Interpretation as celestial body. Association with tocapu-ish signs (boxes with a number of parallel black lines intersect at various angles with other segments to form a patterned network = water or sand?). 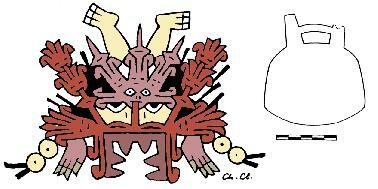 Iconographic Features: very elaborated version of a Rayed Face with Trident Crown and Upturned Mouth Mask (Proulx 2007, 111) consisting of a feline face and two human arms. It is depicted with bloody mouth and surrounded by fishes. It holds two clubs (?) 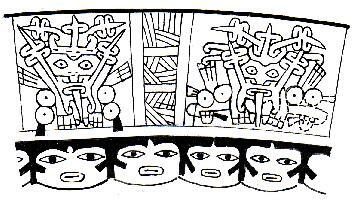 similar to those of Moche warriors. A seated warrior surrounded by spears (=battlefield) and another Rayed Face appears above. 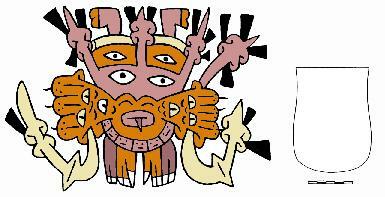 Interpretation of the Rayed Face with Trident Crown and Upturned Mouth Mask as celestial body. Iconographic Features: Rayed Face with Trident Crown and Upturned Mouth Mask (Proulx 2007, 111) consisting of a feline face, two human legs and two legs of an animal. It is depicted with bloody mouth. Interpretation as celestial body. Description: double spout bottle, C-10116, M.N.A.A.H.-Lima. Iconographic Features: Rayed Face with Trident Crown and Upturned Mouth Mask (Proulx 2007, 111) consisting of a feline face, two human legs and two human arms. Interpretation as celestial body. Description: cup bowl, C-35475, M.N.A.A.H.-Lima. 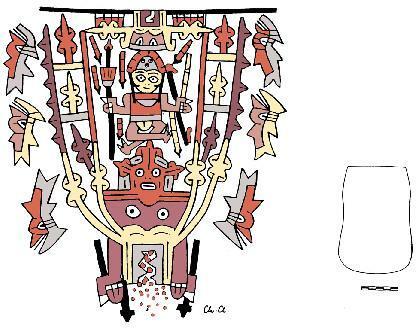 Iconographic Features: Rayed Face with Trident Crown and Upturned Mouth Mask (Proulx 2007, 111) (mid) and two Surrounded Heads (Proulx 2007, 112). Rayed Face with Trident Crown and Upturned Mouth Mask consists of a feline face with extended bifurcated tongue in the shape of two serpents. Surrounded Heads consist of a feline face framed by two paws and peppers. Interpretation as celestial bodies. The painting is outstanding because of leaving the Surrounded Heads unpainted to contrast them against a painted Rayed Face with Trident Crown and Upturned Mouth Mask. Description: large bowl, ID number missing, Museo Regional de Ica. Iconographic Features: Rayed Face with Upturned Mouth Mask consisting of a feline face and two human legs. Two sleeves indicate human arms. Two One-Eyed Rayed Faces touch the main figure with the tip of their extended tongue indicating grasping/attacking. Forehead ornament of the main figure in the shape of a One-Eyed Rayed Face. Interpretation as celestial bodies. Description: effigy bottle, ID number missing, Kemper Collection. Iconographic Features: unusual version of a modeled Rayed Feline Face. Interpretation as celestial body. 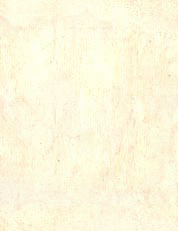 Description: plate, drawing after Anton 1982. Chronological Era: Early Intermediate Period (EIP), Nasca 7 Phase (?). 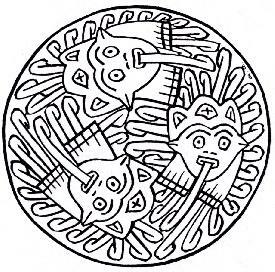 Iconographic Features: three Rayed Feline Faces forming a circle or chain. They consist of a feline face and two paws framed by rays. Interpretation as celestial bodies. Description: effigy bottle, ID number missing, M.N.A.A.H.-Lima. Iconographic Features: representations of Rayed Feline Faces decorating the mantle of a noble woman holding pepinos. Rayed Feline Faces consist of a feline face and two human arms. They hold clubs. Interpretation as celestial bodies.